Occult Rock Magazine: The Devil's Blood to release final album: "III: Tabula Rasa or Death and the Seven Pillars"
The Devil's Blood to release final album: "III: Tabula Rasa or Death and the Seven Pillars"
The Devil's Blood announced at the beginning of 2013 that they have "returned to nothingness." At the same time, they announced that plans had already been put into motion to release new material. The new seven song album, III: Tabula Rasa or Death and the Seven Pillars, will serve as the band's final full-length release. 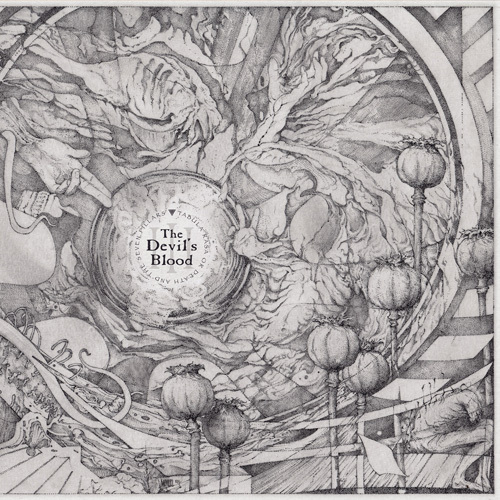 A new track, White Storm of Teeth, has been made available for streaming at metalblade.com/thedevilsblood, where fans can also pre-order the album, and view the art, which was done by Manuel Tinnemans. III: Tabula Rasa or Death and the Seven Pillars will be available for purchase on iTunes April 30th, via all other digital outlets (Google Play, Amazon MP3, etc.) on May 28th, and on CD and vinyl June 11th. SL comments on the release: "Prior to our disbanding on the 22nd of January 2013 we had been active with the pre-production of what was to be our third album. 7 songs, the complete outline of the album, had been, in humble form, recorded in my home recording studio and these demos were supposed to be the template for our studio recordings. Obviously we would never make it that far and the initial shock of that fact saddened us greatly. After but a few days we listened to this material again and decided that even though the audio quality might not be what people have come to expect from a The Devil's Blood release, the song material was and is the best we have ever done. We came to the conclusion that these songs deserve to become a part of The Canon and that we would release them as is. "I spent a few days gathering all the demo material together, made a very simple mix and gave the material to our friend and mentor Pieter G. Kloos to master in his studio. Here we present you with the titles of the material and the artwork which was done by Manuel Tinnemans. "The song we have chosen to release now is "White Storm of Teeth". More so than the other material this song speaks to the completion and transubstantiation that always follows an Occult path. Not the end of a journey but the start of a completely new one. Built around thirteen stanzas in the first part and thirteen stanzas in the second part the process of inner enlightenment through confusion and entropy and the initiation through the Death of the lower self is illustrated. This theme is rampant throughout the record and its lyrics but here it culminates and completely devours itself. After this work no words are needed and, on the album, none are offered. "The Devil's Blood has always been an entity that defied any fealty or thankfulness towards any earthly influence. But we as people need not hold to this paradigm any longer. We therefore wish to express our sincere thankfulness to all those who have supported this weird quest and have made the earthly woes to not work against us. You most definitely know who you are." "The record will be released by Ván Records in Europe and the rest of the World and by Metal Blade in North America. It will be available as digital download, CD and LP starting the 30th of April in Europe and a date soon to be announced in the USA/CAN. With thankfulness and a glad heart filled with the pride of a work well done, SL/…/AO"
Fans can also order the last remaining vinyl copies of The Thousandfold Epicentre. The gatefold double vinyl deluxe edition is limited to 1,000 copies worldwide and includes a full color 12 page 12"x12" insert. Preview the beautiful packaging at indiemerch.com/metalbladerecords. 3. …If not a Vessel?